Kids love getting wet on warm, sunny days and water parks are a big attraction in Myrtle Beach, South Carolina. When you stay in a hotel with a water park of its own, the fun of Myrtle Beach's big water parks continues. Several family-friendly hotels include admission in their room rates or resort fees, and in some, non-guests may pay a separate admission. 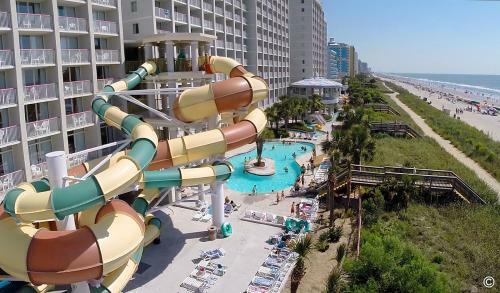 If you're looking for the absolute best water park experience right on your doorstep at a Myrtle Beach resort, these two options will certainly put a smile on your face. 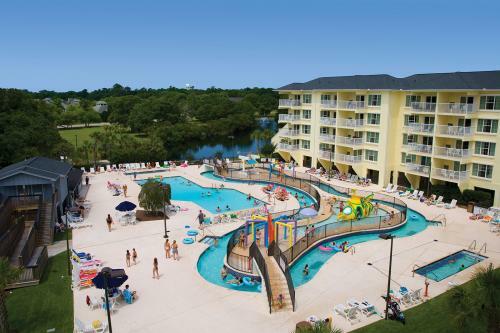 When one water park isn't enough, head for Dunes Village Resort where there are two on site. 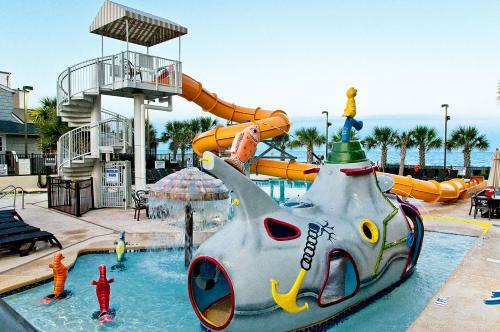 The only Myrtle Beach location listed in America's top 10 water parks on Oyster.com, Dunes boasts such water features as Lazy River, Wild Winding Waterslide, Speed Slide, a heated pool with basketball hoop, adults-only pool, and a hot tub. 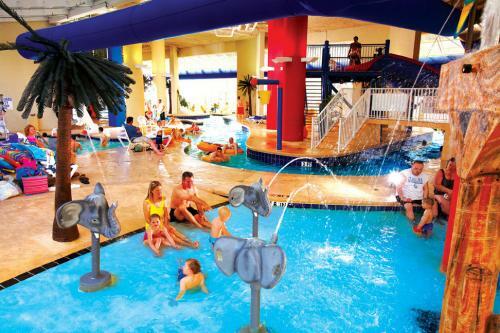 Inclement weather doesn't halt the fun, as Dunes Village Resort has this destination's only full-sized indoor water park facility (complete with pool, shuffleboard, and ping pong on the pool deck) and a staffed activity kids club which is open year-round. 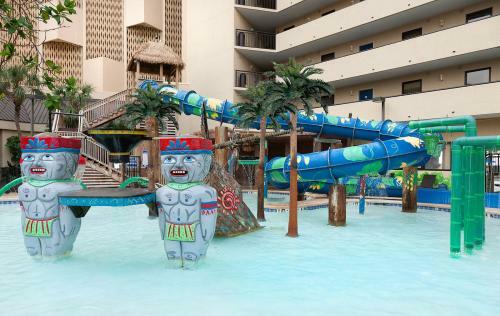 Highlighted in 2017 on a TODAY Show and TripAdvisor list of America's top 10 family resorts on a budget, admission to the 30,000-square-foot water park is included in the hotel's guest resort fee. Low season rates are from about $65 and high season around $300 per room. Get your fun at the rate of 800 gallons per minute when you shoot down the 302-foot length of Twister Body Slide. Take an even wetter trip in a single or double tube on the Explosion Water Slide where the water rushes at 2,500 gallons per minute. At Crown Reef Waterpark, both of the 38-foot high giant slides are reserved for kids more than 36 inches tall. Winding through an array of outdoor pools is the longest oceanfront resort lazy river in Myrtle Beach. Silly Sub, a 20-foot-long Kidz Twister Slide, year-round enclosed Salty's Splash House and a coinless arcade add to the fun. Steps from the pools lead right down to the beach. Low season rates are about $85 and high season starts around $265 per room. 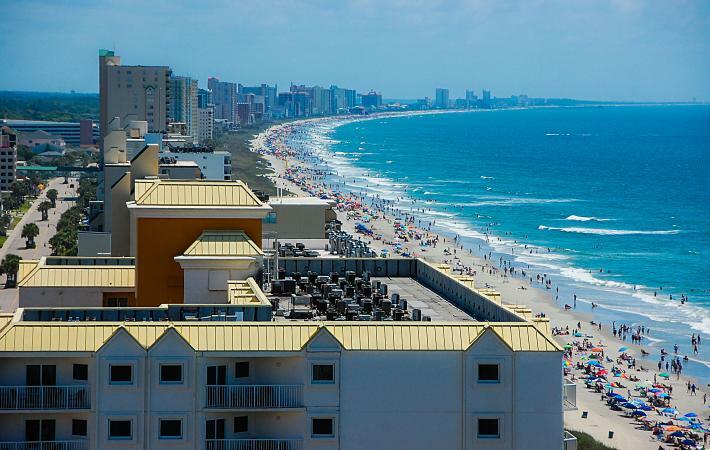 There's water, water everywhere at oceanfront hotels with water parks in Myrtle Beach. Popular with families, the South Carolina destination is at the heart of the Grand Strand, a 60-mile-long swath of uninterrupted coastline dotted with resorts, golf courses, putt-putt mini golf, amusement and water parks. A high-rise oceanfront family resort with 14 indoor and outdoor pools in all, Caribbean Resort and Villas has a seasonal water park. 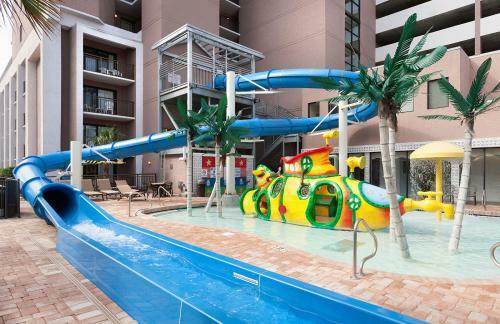 Kids love to navigate Pirate's Plunge, have an underwater adventure in Silly Submarine, and drift along one of the two lazy rivers, both indoor and outdoor. Toddlers can splash about in the kiddie pool and grownups may want to soak up some sun on the pool deck while the kids plunge in. Bring the extended family and friends as four-bedroom oceanfront accommodations with balconies can sleep up to 12 people. Low season rates are from about $50 per room, whereas the high season is in the $300+ range. You'll need all your fingers and toes to count up the number of pools at The Breakers Resort. Kids pretend to be buccaneers in the mid-pool sunken pirate ship overlooking the ocean. There are dueling water slides, water cannons with splashing water buckets, and floating sea life to spice up adventure and feed the imagination. An oceanfront deck with multiple pools, whirlpools, and hot tubs stretches across all six towers at the resort, overlooking a span of white sandy beach. Rates start at about $50 per room in low season, rising to $175 on weekends in high season. 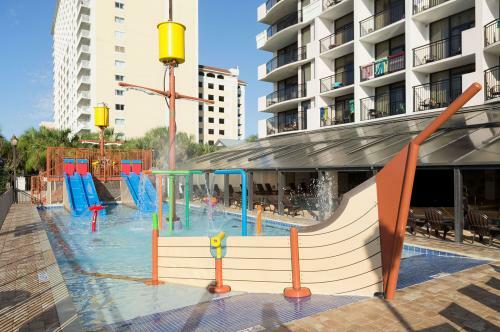 Sun and fun on the Grand Strand at Ocean Reef Resort's Ship Wreck Water Park features the Lagoon Launcher water slide and the indoor/outdoor Lazy River around the swimming pools. Decorated with a giant Tiki Men theme, adventures include sunken treasure, a sea serpent, and a waterfall. Ocean Reef's Cancun Lagoon has indoor and outdoor hot tubs for adults, knee deep water pools for younger children, and a Banana Boat eatery for everyone. Three towers on the beachfront have condos with up to four bedrooms, as well as hotel rooms. Low season rates start at $50, getting to about $300 a night in high season. Kids won't want to wait before diving into indoor and outdoor swimming pools galore at Long Bay Resort's Silly Sub Water Park. Glide slowly along the 250-foot-long enclosed lazy river or race down a three-story tall waterslide that's big enough for adults too. The oceanside hotel has four hot tubs for guests in its condos and rooms on a long, quiet stretch of beachfront at the north end of Myrtle Beach. A double room in low season may be under $50 per night, rising to $225 in high season. Benefit from a more secluded atmosphere without leaving the busy Grand Strand. On Pawleys Island, an Atlantic coast barrier stretch of land, Litchfield Beach & Golf Resort covers a sprawling 4,300 acres. The beachfront estate has three 18-hole golf courses and 17 clay tennis courts as well as a low key water park featuring an indoor pool, children's pool, and a lazy river. During low season, room rates begin at approximately $60; high season is just over $200. Pack a swimsuit and a spare. If you're coming to Myrtle Beach for a family vacation, you will get wet. In addition to Atlantic waves and surf, there's even more water park fun at four major attractions: Family Kingdom Amusement Park, Splashes Oceanfront Waterpark, Myrtle Waves Water Park, and Wild Water & Wheels.